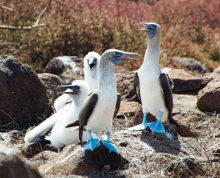 My third visit to Galapagos but this time was special three times over. 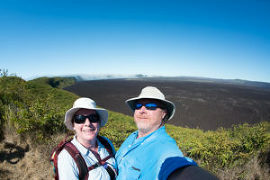 My wife, Red, came along and we got to spend a week touring Quito and several islands of Galapagos together. Then she continued on for a few more days while I was joined by my two dear friends Alice and Shawn on the dive boat Nortada with Jorge of Galapagos Rebreathers. She got some amazing photos of the blue footed boobies and a lot more of the wild life and scenery. You can see a selection here. For me the diving wasn’t as good a previous years due to lower visibility but the things we did see where very unique. 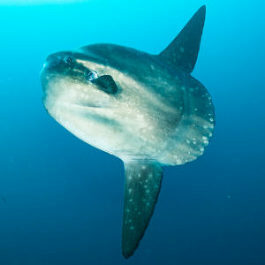 Most divers hope to some day see a Mola Mola, we got to see 15 on one dive! Totally unheard of! These are truly some of the strangest animals on the planet. Also unique to Galapagos are the marine iguana that dive down to eat algae and can hold their breath for up to 40 mins. The every present sea lions were a joy to engage with as well. See more photos here. We finally did it, chartered a sailboat for a week! Along with 5 other friends we spent a week sailing the British Virgin Islands on a Lagoon 450 catamaran. Truly luxury on the water! We used Catamaran Company for the charter and everything was easy and smooth. Our boat was “Between the Sheets” a great boat in very good condition but now retired. Highly recommend using Catamaran Company for chartering! The seven of us got along well all week and remain friends – speaks to the friends! I was able to do a repeat of the CCR only trip diving Galapagos that I enjoyed in 2013. As always it was awesome! Jorge Mahauad, owner of Galapagos Rebreathers, and Andy Philips put on a great trip. We had tremendous hammerhead and whale shark action including a massive pregnant female on a 360 fly by during our safety stop! Checkout the video! Here I am with her, I have the yellow bailout tank. Checkout the compilation video of the trip here. Photos can we looked through here. I also got to see my first mola mola that came in for a quick pass. Unfortunately I didn’t have the camera for that dive as it was our first checkout dive! Galapagos truly is *the* big fish action location on the planet and diving it with my brand new SF2 CCR was a real treat. 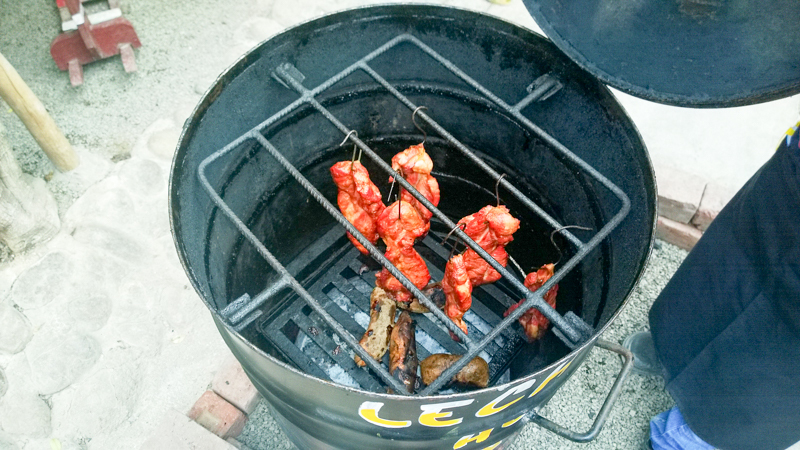 The unit is so easy to use and travel with and seems to be completely reliable – this was my first trip on it. If you haven’t guessed we love animals and the bigger and/or more exotic the better! So swimming with humpback whales and their newborns was high on the to-do list. There are two primary places to do this in the world, the silver banks north of The Dominican Republic and The Kingdom of Tonga in the south Pacific. Given we wanted to do this right and the visibility is so much better in Tonga we oppt’d for there. Thus started a 3 year wait as the boat to do this from, the Fiji based Nai’a is in high demand. Then there was a trick of getting there from Seattle. Given our Fiji Airlines adventures in the past we weren’t going that route. Anything else out of Seattle was a nightmare trip, however it turns out there’s a non-stop from Vancouver BC to Auckland, New Zealand which is a short flight away from Tonga. Perfect now we could see New Zealand too and visit our friend Pete Mesley who runs Lust4Rust. The whales go to Tonga to give birth and raise their young for the first few months. Surprisingly the mothers are many time very tolerant of us being in the water with them. The young ones are curious and playful. We had one youngster rocket up from mom and breech right in front of us while we were in the water! Something our guides had never seen. Also something a bit dangerous because he’s still about 12′ long! Checkout the images of our whales. And some adventures on Nai’a. In our opinion no visit to New Zealand would be complete without a visit to one of the Lord of the Rings movie sets. Yes geeky but a must. For us being on the north island that meant Hobbiton. Was a good time along the way we drove to several other locations on the island with an Aussie friend of ours who flew over to join us. Corrie is an excellent traveling companion who we met in the artic on this trip. Photos of our time in New Zealand are here. You see I didn’t want to go see it the same way everyone else does. It just wouldn’t be us. So we found Mountain Lodges of Peru and their horseback riding option. While a beautiful adventure it was anything but simple or easy. Read Red’s blog for the scoop. Of course that wasn’t the end of it. Since we were spending that much to get there we needed to see more. So as usual we contacted my good friend Jim Harlan owner of Uncommon Adventures. Jim suggested and put together an awesome itinerary that would take us from ocean, to desert, to jungle, to cities & ruins in the mountains. Three and a half weeks of constant adventure. Travel with us with these images and videos. We started in the Nazca desert along the coast south of Lima. Trying local foods such as cuy and lechon al cilindro. In the desert are the famous Nazca lines. We took a brief overflight to see them. This involves hours of waiting for the weather to clear or not clear. We got lucky and at the last moment the sky cleared and we were off. See our desert and ocean photos here. 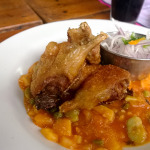 Guinea pig – very tasty! Next up was the jungle. I had no idea what to expect and oh man were we in for an adventure. 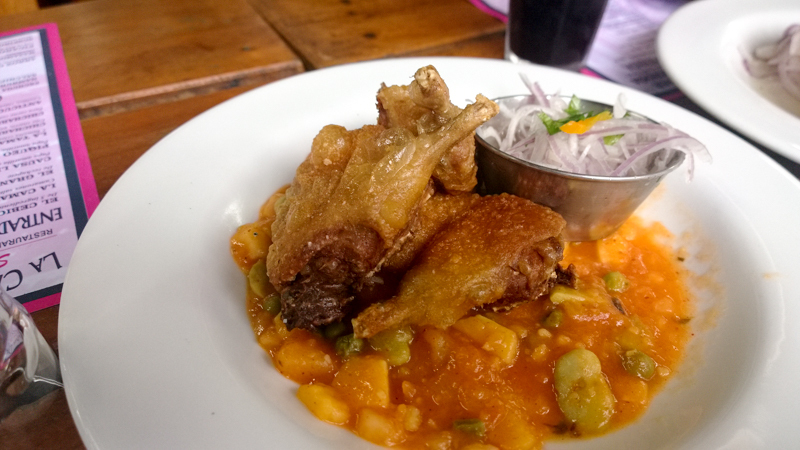 It took two days from Cusco just to get to the lodge deep in the amazon. No power, some warm water and Red ended up with cockroaches in her hair waking her up. They call it eco-tourism I call it eco-terrorism. 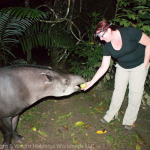 While we got to see some cool things, such as the tapir and the macaws you see below, I’m not sure I would repeat. Read more about it and see the pictures on this page. 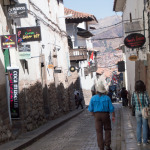 See more of Cusco, the surrounding area and our adventures here. The last segment of our trip was the one that started the planning – a week on horseback over the Andes and to Machu Picchu. A difficult trek it was peaking out at over 4600m in altitude over 5 days of riding and a full day of hiking. We had the most gorgeous weather and amazing, beautiful scenery! Seeing Machu Picchu, at first from 4 km away from another mountain top and then from inside at dawn was an impressive experience. It truly is an amazing place! We had the opportunity to stay at the Belmond Sanctuary Hotel right at the ruins. This is a seriously impressive hotel with access unlike any other. It’s not cheap but it’s worth it and the customer service is stellar. See a selection of our images from this last section of the trip here. Overall an amazing trip, a fascinating country, great people, good food and fantastic scenery! Well worth the visit! Welcome to the brand new Wright Trips site! Enjoy your visit and if you see something you'd like to have custom printed and framed to decorate your home please checkout Wright Holdings and we'll work with you to create something beautiful just for you. 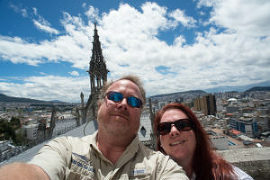 See Red's travel blog for detailed tips on how to travel the world.